In the 1st century BC, Armenia and Parthia (Persia), already tied through intermarriage between royal Arshakid houses, were engaged in war against the Roman empire. Within this struggle a new King rose, Tigran II (Tigran the Great, reigned 95-56 BC). Held as a hostage at the court of the Parthian kings, Tigran was released in return for the cession of seventy valleys in the neighborhood of Atropatene. His first act, after his ascension to the throne in 95 BC, was to seize the small kingdom of Sophene, reuniting two separate kingdoms on Armenian territory. What remained was a third part, lesser Armenia, located beyond the Euphrates. That had been annexed by Mithridates Eupator of Pontus. 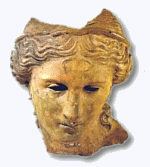 A treaty of alliance between the two rulers was sealed by the marriage of Tigran to Cleopatra, Mithridates' daughter. Internal troubles in Persia, following the death of the Persian King Mithridates the Great, gave Tigran the chance to recover the 70 valleys he had been forced to cede as a young prince. In victorious campaigns between 88-85 BC he did that and more, occupying northern Mesopotamia and imposing his rule over those who had been under Parthian control. The treaty concluding the war gave Tigran the Parthian title 'King of Kings'. Tigran followed this by next turning his arms against western countries, occupying Northern Syria (where he was given the Syrian crown in 83 BC), advancing into Phoenicia and Cilicia, and seizing several Cappadocian cities. By the year 70 BC, Tigran had become the most powerful ruler of the Near East, his vast empire stretching extending from the Caspian to the Mediterranean and from the Caucasus to Palestine and Cilicia. With his alliance to Pontus, he controlled the entire lands between the three great seas of the ancient world. How do you follow that act? Build a capital. Tigran founded the new capital, Tigranakert, at the foot of the Taurus Mountains, west of Lake Van. Some scholars locate the city as that of the medieval town of Martyropolis (modern Farkin or Mayafarkin). The capital was legendary in its time. City walls rose to a height of 50 cubits, and were so wide entire warehouses and stables placed there. Like all Hellenistic cities, Tigranakert had a theatre in which Greek plays were performed. A magnificent palace was built outside the ramparts, surrounded by gardens and hunting grounds. This flew in the face of most citadels, which kept the king inside the fortified walls, and indicates how secure Tigran felt. 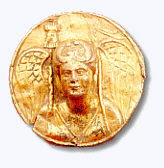 In order to populate his new city, Tigran forced the inhabitants of twelve Greek cities that he had destroyed relocate there; several Greek scholars came of their own accord and Tigranakert became the principal center for Hellenism in the empire. The population also included Armenian nobility, and Plutarch noted that every common man and every man of rank sought to adorn the city in imitation of the king. And his power became legendary as far away as Rome itself. According to the Greek biographer Plutarch, the Roman general Lucullus said of Tigran II, "In Armenia, Tigran is seated surrounded with that power which (he has) wrested Asia from the Parthians, which carries Greek colonies into Media, subdues Syria and Palestine and cuts off the Seleucid�s�. Cicero, the Roman orator and politician, added, "He made the Republic of Rome tremble before the powers of his arms." Tigran's continual conquests stretched the capabilities of the new kingdom, and family feuds (his son by the daughter of a rival king attempted to usurp the crown on several occasion), combined with continual Roman and Parthian invasions eventually shrank the great empire to just beyond Artaxes� kingdom of Greater Armenia..
What follows is a short (and sometimes confusing, with son against father, and alliances shifting sides so many times) contemporary account of the ever changing relationships between the three powers; and a good example of just how tenuous power really is. Those of you follow Soap Operas should have no trouble at all with the plot line. According to contemporary accounts by the Roman historians Plutarch, Dion Cassius, Memnon and others, the Armenian-Roman war began in the Spring of 69 BC, when the Roman ruler over Asia, Lucullus, under the pretext of pursuing Tigran's father-in-law Mithridates of Pontus, invaded Armenia by way of Sophene and surrounded Tigranakert. On October 6, 69 BC, the Armenians engaged in battle with the Romans at Tigranakert and lost, forcing their retreat to the East. Greek mercenaries opened the gates of the city, which the Romans immediately plundered. For the gladiator celebration of the triumphal games Lucullus substituted for lions the actors Tigran had invited for the opening of his theatre. In pursuit of the Armenian army, and attempting to capture Artashat, the Romans engaged in a second battle near the Aratsani River in the summer and autumn of 68 BC. This time Lucullus was defeated, and forced to retreat to the south, where he occupied Mtsbin (Nisibin). In 67 BC, Tigran drove the Romans from Armenia and began to retake Cappadocia. Mithridates (the pretext for the war) retook his kingdom with the help of the Armenian army, and the Roman senate recalled Lucullus, setting the governor general Pompeius in his place. Meanwhile, Tigran�s son (Tigran Junior) revolted against his father, forcing the elder to return to Armenia to protect his kingdom. Pompeius resumed war against Mithridates and at the same time began negotiations with the Parthians, asking them invade Armenia. In the spring and summer of 66 BC Pompeius broke Mithridates' resistance, forcing his followers to escape to the Bosphorus (Crimea and Taman peninsulas). Tigran defeated his son in Armenia, forcing Junior to flee to the side of the Parthian king Hrahat III (called �Phraates� in Roman accounts). The Parthian king accepted the crown prince Tigran Jr., giving him his daughter in marriage. The Parthians attacked Armenia, reaching as far as Artashat, but Hrahat returned to Parthia to raise an additional army, leaving Tigran Jr. with the army. Tigran Sr. attacked the army and defeated his son yet again. Junior flees yet again, only this time to the Romans, who set him up as a leader in the army of Pompeius, which entered Armenia in the summer of 66 BC, taking the shortest route possible, and moved toward Artashat. Tigran Sr. understood he could not fight both Rome and Parthia due to internal dissidence in his troops, and personally came to the Roman camp on the outskirts of Artashat, to see Pompeius and begin negotiations. In 66 BC Tigran made treaty with the Romans, renouncing his southern territories. As he surrendered the city and kingdom, he was told by Pompeius �he had not lost the Armenian kingdom, but gained the friendship of Rome� (Dion Cassius). 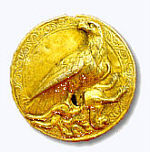 Tigran Sr. was forced to pay 6000 talons (about 171 tons) of silver in tribute, and relinquish his new conquests, but he retained Greater Armenia and the Armenian lands he had reunited earlier in his reign. He was also awarded a part of Pontus. Tigran Junior fled again, and began to fight against Pompeius, who captured him and imprisoned him in Rome. In 65 BC, the Parthians finally attacked Armenia, were repelled by the Romans and forfeited native lands taken from the Armenians. In 63 BC, Mithridates Eupator of Pontus attempted to organize a new campaign against Rome, but his son Pharnakos revolted against his rule, surrounded the old king with an army. Mithridates commited suicide. By 56 or 55 BC, Armenia Major (or Greater Armenia) had enjoyed a total of ten peaceful years from 40 years of rule under Tigran the Great. Tigran died at the age of 85, leaving his kingdom to another son, Artavazd II. Tigran�s son, Artavazd II, governed Greater Armenia for 20 years, forging an alliance with Parthia, from which both waged wars on Rome. Thoroughly confused? Well, let�s reduce events a bit. Artavazd II is no fool like his brother. In less than 3 years he forged an alliance with Parthia, and the combined forces wage war against Rome. The Hellenistic traditions of theatre and performance thrived in Artashat, which was called the Carthage of the East, for its beautiful temples, buildings and planned landscape. In contemporary accounts there is a tale of how the Armenians used a dramatic event to announce a major victory against Rome. The story is about a performance in 53 bce of Euripides� tragedy �The Bacchae�. Attending the performance was the Parthian King Orod (Herod) and his son Poksor, who was married to Artavazd'z sister. The Armenians and Parthians had won a major battle against Rome just before the performance, in which the Roman general Crosus (�Craxis�) was captured. The head and right hand of Crosus was severed from the body and used in the climactic moment of the play, given to the Parthian King during the performance. Several brilliant victories against the Romans ensued, but Artavazd was captured and brought by Mark Antony to Egypt in chains. Artavazd�s reign ended at age 60, when Mark Antony captured him in battle and had him brought to Egypt as a prisoner. He was imprisoned for three years before his death. Some say he was executed for refusing to name Cleopatra his queen, but Dion Casseus wrote that Artavazd "did not refuse to name Cleopatra as his queen, he refused to beg for mercy" and worst of all, "he called her by her name." (C) 2019 TOURARMENIA. ALL RIGHTS RESERVED. Armenia Lodging, Armenia Hotels, Armenia Motels, Armenia Apartments, Armenian Homestays, Armenia VIllage Homes, Armenia Guest House, Armenia Bed & Breakfasts, overnight, stay, Lonely Planet, Fodor's, Armenia, Caucasus, Lodging. TourArmenia is the pre-eminent and first complete guide to Armenia. Tours, tourists, stays, eat, Armenia.